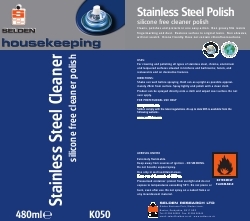 For cleaning and polishing all types of stainless steel, chrome, aluminium and lacquered surfaces situated in kitchens and bathrooms; hotels, and restaurants and on decorative features. Shake can well before spraying. Hold can as upright as possible approximately 20cm from surface. Spray lightly and polish with a clean cloth. Product can be sprayed directly onto a cloth and wiped over surface. Do not over apply.